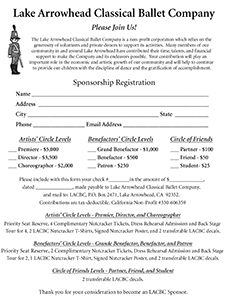 The Lake Arrowhead Classical Ballet Company is a non-profit corporation which relies on the generosity of volunteers and private donors to support its activities. Many members of our community in and around Lake Arrowhead have contributed their time, talents, and financial support to make the Company and its endeavors possible. Your contribution will play an important role in the economic and artistic growth of our community and will help to continue to provide our children with the discipline of dance and the gratification of accomplishment. Please click on the donor application on the right to view and print. Please follow the instructions on the application for mailing and payment. Thank you for your consideration to become an LACBC Sponsor.